I haven’t purchased a CD since 2007. That might sound startling, but I’m just one of many that has been moving their music purchases to the web. 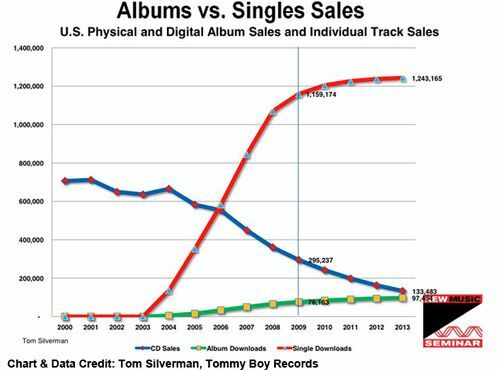 Album downloads are poised to overtake CD sales very soon and there’s a good chance that the CD will simply fade away into oblivion. It certainly wouldn’t be an unexpected death of technology. Even though my music listening preference has held steady for years, it turns out that I’ve also found myself using the MP3 less and less in recent years too. I haven’t calculated the exact percentage, but I’m probably using the URL for at least 75% of my music listening these days. There are drawbacks to listening to music this way. The quality isn’t as good as that of some high-quality audio files and I don’t physically own the files. But the benefits are many. Gone are the days where I need a second hard drive just to house the thousands of MP3s in my music collection. I don’t have to wait until I can pay $9.99 over a secure connection to hear a new album — I can stream it right away at no cost. 3 And, perhaps best of all, I can quickly share the songs I love with my friends with just a couple of clicks. It wasn’t too long ago that if I found an awesome song, I’d have to download and burn the file to a CD and physically hand it to somebody. Downloading and attaching the file to an email isn’t much better either. It takes me seconds to click a “Tweet this” button or copy a URL of a great song ( http://awe.sm/5CXMb ). Nearly 50 percent of US adults browse the web on their phones. That number is growing fast and very few people will be without an Internet-connected device by their side 24/7. There is even 3G service at the top of Mount Everest now. While some sort of audio format will always be needed on the server level, the URL as a vehicle to stream and share music is much more compatible with the mobile world of today than the MP3 ever will be. 2 Apple refuses to accept many music streaming applications into the App Store, most likely because they would lower the number of music downloads through iTunes. Grooveshark Mobile, for instance, is available for download on all other major mobile platforms but can only be installed on a jailbroken iPhone. 3 Most streaming services offer a premium plan too. Spotify delivers higher quality audio to premium subscribers (320 kbps). Grooveshark’s VIP plan is only $3/month for ad-free streaming on a bunch of different platforms.